The former Kingdom of Navarra has had a very turbulent past. The area used to be inhabited by the Vascons but they were driven northwards by the Moors and are the ancestors of the present day Basques. Charlemagne drove out the Moors in 778 but later that year was driven back which is the subject of the twelfth century French epic "The Song of Roland". France regained control later. The three hundred years from 1234 were particularly turbulent as the Navarrese noblemen tried to regain independence. The French were finally defeated with the help of the King of Castile in 1512 when it became part of Spain. The castle was rebuilt by King Carlos III of Navarra and was his summer residence until his death in 1425. Later his grandson, the Prince of Viana, lived in the castle. During the Napoleonic wars it suffered sever damage and was restored to its former glory about one hundred years ago. 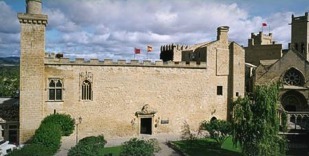 This Parador occupies one wing of this castle which has been declared a National Monument by the government. The decor of the interior maintains the medieval atmosphere, in particular the main salon, which is delightful with an enormous fireplace and large wrought iron chandeliers. In a niche, there is a suit of armour and reliable reports say that it no longer has a knight inside! There are very beautiful stained glass windows on the staircase and in the dining room and arcades with rugs, wrought iron lamps and wooden coffered ceilings. "Magras de cerdo con tomate", ham cooked in a tomato sauce; A wine to try is the white wine (blanco) from nearby Ochao and the red wine served in all the Paradors from the bodegas of Marques de Caceres. In Olite you will feel the charm of the Middle Ages while visiting the Royal Palace, the churches of Santa Maria and San Pedro, and the medieval galleries. This town is the capital of wine of Navarra and has seven separate commercial 'cellars'. A visit to the fifteenth century Bodegas Carricas is suggested. If staying at the Parador of Olite at the beginning of July, visit Pamplona for the festival of ”San Fermin”. Caution is advised unlike the Englishman who first sampled copiously the local wine and then joined in the 'bull-running' with disastrous results. On other dates, visit the town to see the ”Ciudadela” (fortress) and the walls of Zumalacarregui gate. In Olite, the local festival is the "Exaltacion de la Cruz" which takes place on September 13th. The mountains of the Pyrenees are superb to the lovers of mountain sports. In particular the reception is able to arrange a rafting trip along a swift flowing mountain river. 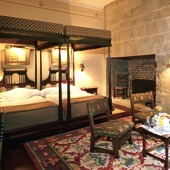 Olite Parador has thirty eight twin bedded rooms, three rooms with a double bed, one single room and one easy access room. All the rooms have private bathrooms. The bedrooms also have a telephone,satellite television, a safe and a mini bar. These guest rooms are very tastefully furnished and many have balconies with views over the pine woods. Parador Olite has air conditioning and central heating, currency exchange, lift, piped music, satellite television, gift shop, free wireless internet, restaurant and bar. Facilities are available to hold business meetings. Passengers and cases can be unloaded from a car at the main entrance to the hotel but the vehicle must be moved to the car park which is 150 yards away. Distance from the nearest airport is approximately 35 kms, the nearest train station is 200 mts away and the nearest port is 135 kms away. A beautiful Parador in the heart of Olite and a perfect place tot visit the Bardenas Reales. The staff is friendly and helpful and we had a pretty room with a little veranda overlooking the monastry with its vinyards. Our stay in Olite was delightful. We enjoyed dining in the restaurant and found the staff very accommodating both at breakfast and dinner. The parking was not a problem and the rooms were clean and bright when the drapes were opened. Yet, they were nice, dark, and quiet for sleeping soundly. I always am happy to turn in for the night in a bed with freshly starched linens! Paradors do not disappoint! We enjoyed the adjoining castle, the friendly people of Olite, and local wineries. Our dinner in a local restaurant the second evening of our stay was lackluster and much of the food was previously frozen. Stick with the parador dining room or bar. The Parador in Olite is right in the middle of the town so easy to walk everywhere. Parking is not easy but there is a public car park 5 minutes walk away. The Parador itself was disappointing on a few counts - the room we had was very dark with heavy drapes over the windows which were presumably to cover up the flat roof outside. Also the room was on the small side for a double. The service in the restaurant was disappointing as was the quality of the food served for the money. We wished we had gone to one of the other local restaurants. 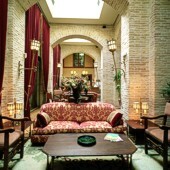 Comment posted by K. F.
We would like to say that we had a wonderful time at the Olite Parador. Although parking was outside the town the staff helped us unload our car – and put our bikes in a secure room for the night. We had a lovely meal in the restaurant and all the staff were friendly and helpful. We stayed for one night and the parador is ideally located for exploring Olite, which is a very interesting place. 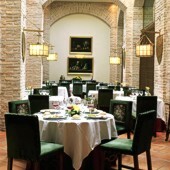 Parador de Olite is a hotel in a medieval castle in the Pyrenees region of Spain.